We believe that our department’s success goes beyond having the equipment and infrastructure in place for our students and teachers. To truly support our users we have placed customer service as our highest priority. With a mantra of “Smile and Say Yes” we are committed to provide whatever our teachers and students need to be successful. Goal 1: Utilize technology resources to enhance classroom instruction and improve student achievement. Students will integrate interactive technology into their day to day activities. Use 21st century interactive technology embedded in daily lessons. Learn to analyze and synthesize critically in order to evaluate resources. Improve communication skills through technology enabling students to communicate through writing, research, presentation, and publishing. Increase administrative uses of technology. Establish an ongoing process of assessing the use of technology by all stakeholders that will result in improved instructional planning. Provide instructional documents, assessment data, and professional learning for administrators and instructional personnel. Goal 3: Provide parents, the community, and other stakeholders with technology resources and support. Establish and maintain electronic communications solutions among parents, teachers, and administrators. Establish and maintain ongoing student progress reports that are available to parents on the internet. Goal 4: Provide competent and timely support and a robust, stable, and secure network. Utilize technology to support the professional growth of all staff which will result in maximum learning for all students. Provide appropriate hardware and hardware maintenance to enable staff and students to meet instructional and administrative goals. Continue to evaluate and provide appropriate technology protection measures and internet safety policies as well as internet safety curriculum that provides for educating minors about appropriate online behavior, including interacting with other individuals on social networking websites and in chat rooms and cyber bullying awareness and response with respect to use of computers with internet access by minors as outlined in the Valdosta City Schools Internet Safety Policy for Children's Internet Protection Act (CIPA). "Your Future, Our Mission. Imagine the Possibilities!" Linda Sermons, our VCS MSOTY this year, has now been named the Georgia Library Media Association's and Georgia Association of Instructional Technology’s South Central GA District LMSOTY winner and will be representing us at the GLMA Summer Institute June 12-13 where the LMSOTY for the State winner will be announced. Media Specialists are required to do much more than help students check out books. Media Specialists must be technologically savvy and help their students and peers become savvy as well. Ms. Sermons has leadership roles with her school’s Leadership Team, School/Community Relation Coordinators, and is the site administrator for her school’s website as well as their Facebook page. She promotes reading by hosting an Accelerator Kick-Off with a school wide pep-rally and guest author. Also, during the school year by hosting Book Fairs, Read Across America, Dr. Seuss Day, Jumpstart "Read for the Record", National Library Week, and Children Book Week. Her philosophy of the library media program is to assist all students in becoming active and creative locators, evaluators, and users of information to solve problems, think critically and to satisfy their own curiosity through research and reading experiences. As the media specialist she works collaboratively teachers, administrators, and others to facilitate this experience. and JL Lomax for another VCS WIN!! Over the last several years we have evaluated the computers and other technology in our schools and implemented an aggressive replacement plan during the FY2013 academic year. During this time we have replaced our desktops that were considered to be out of date and increased our system devices such as Chromebooks by additional 3300 plus. Included in this initiative are also projectors and printers that have reached end of life status and must be removed in order to continue using some needed classroom resources. 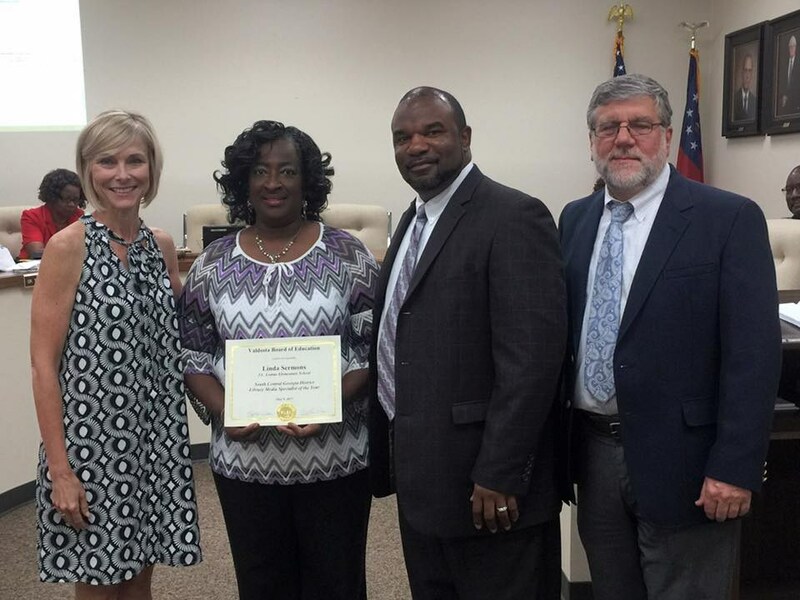 Valdosta City Schools has once again been awarded the Connections for Classrooms Grant for multiple projects that have improved the infrastructure and increased bandwidth available to classrooms. Connections for Classrooms is a grant program joining multiple state agencies around the common goal of ensuring Georgia schools and classrooms have the high-speed broadband access required for digital and blended learning. The program is part of a broader statewide effort to expand classroom high-speed broadband access in response to Governor Deal’s Digital Learning Task Force recommendations as well as the GaDOE’s efforts to enable personalized learning for Georgia students. The Valdosta City Schools Technology Department is proud to have accepted the Enterasys Networks Exemplary School Award for the district. This award was presented in recognition of the planning and implementation of a system-wide Wifi network, a project that has spanned the last three to four years, in preparing VCS for BYOD initiatives. "In the not too distant past, if you looked at public education, you would have probably seen some technology deployed to some classrooms. However, in today's interconnected global economy, having the right technology deployed to all classrooms is required to adequately prepare your students as they graduate and head off to college, the military, or the workplace. Fortunately, Valdosta City Schools recognizes this, and has implemented a network infrastructure that has created 21stcentury connected classroom providing your teachers an environment that engages students, and more importantly, inspires them to want to learn through the use of technology.